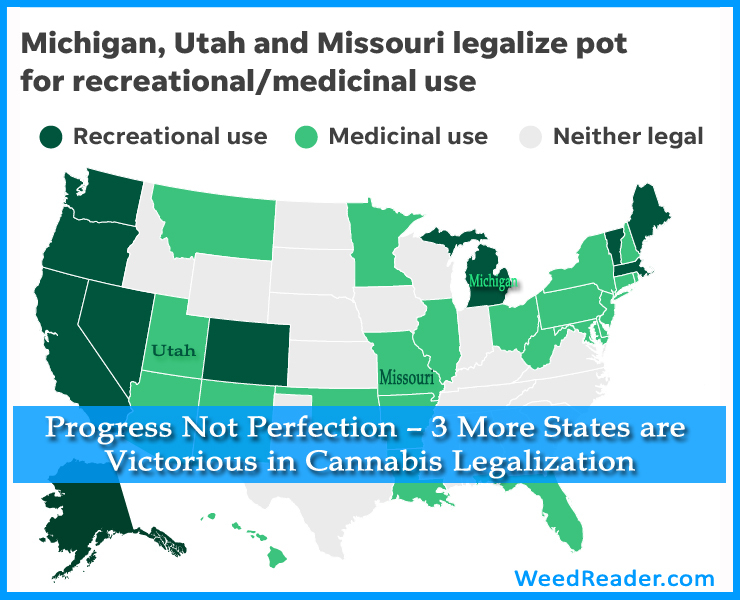 Progress, not perfection was seen this year in the 2018 elections regarding cannabis legalization. Draconian cannabis prohibition is slowly coming to an end in the United States. America is falling behind in the global cannabis community that is continually growing. Thanks to outdated laws pertaining to a widely misunderstood plant, countless lives have been ruined. Luckily states are taking the initiative to listen to the will of their citizens. Cannabis legalization is widely supported in the United States with some polls showing that support between 60 to 80%. Advocating an end to the US Federal government’s outdated marijuana prohibition, Michigan voted yes for adult use cannabis. Missouri and Utah also join the ranks of so many others taking a stance voting yes for medical cannabis. Proposal 1 received the majority of support from voters with a 56 to 44% vote. This makes Michigan the first Midwestern state to legalize adult use cannabis. Don’t get too excited just yet. Your dreams of going to a dispensary anytime soon may have just went up in smoke. Like so many states Michigan is expected to have delays while the infrastructure and framework for retail cannabis are set up. Predictions put the first commercial sales of adult use cannabis around 2020. Residents of Michigan will be able to grow up to 12 plants for personal consumption. Adults 21 and up will be allowed the possession of 2 and 1/2 oz of cannabis on them personally and up to 10 oz at home. As with anything in the US federal government nothing is set in stone. The legislature could still amend sections of the proposal if they rallied a 3/4 vote. The only areas so far that have any mention of possible changes is how many plants can be grown, issues with how communities vote for cannabis and sales tax. Be sure to keep your eyes peeled in the state of Michigan as it’s setting up to be one of the largest consumer cannabis markets in America. Amendment 2 received a 66 to 34% vote in favor of passing medical cannabis! This allows the Show Me State to show just how effective cannabis can be as a medicine. Doctors in the state of Missouri are able to make recommendations for medical cannabis as they see fit. There are no specific qualifying conditions in the state. Those with a physicians approval will receive identification cards allowing them or a registered caregiver to grow six plants as well as purchase a monthly allotment of 4 oz from dispensaries. Missouri will have a 4% retail tax placed on medical cannabis sales. Amendment 3 failed with a 31 to 69% vote while Proposition C also failed with a 44 to 56% vote. In the coming weeks more, information about when access will be available in the state of Missouri is sure to unfold. Citizens of Utah can now truly live life elevated. For those who are suffering from debilitating medical conditions, chronic pain, and other life-altering symptoms, they will soon have access to medical cannabis. Utah was considered to be among the most conservative states in the nation. Voters in Utah have spoken with a 53 to 47% vote in favor of legalizing medical cannabis. Proposition 2 states that patients will be required to receive a physician approval to be issued state identification cards. This would allow patients to purchase 2 oz of cannabis or products that contain 10 grams of cannabidiol or tetrahydrocannabinol every two weeks from a dispensary. For those who live more than a hundred miles from a dispensary, they would be allowed to cultivate six plants. While smoking cigarettes, cigars, and pipe tobacco is still legal in Utah, smoking cannabis flower is not under the current measure. As you can see with these laws, they are progress, not perfection. Cannabis legalization is inevitable in the United States, but it is being controlled and regulated by those who have a proven history of greed. U.S. politicians are allowing America to fall behind while the rest of the world partakes in a multibillion-dollar green industry. These three states are yet another victory. While many people are celebrating this victory, please don’t forget the countless lives destroyed and those still sitting behind bars because of this plant loved by so many. Free the weed, and free the people that support it, progress not perfection.